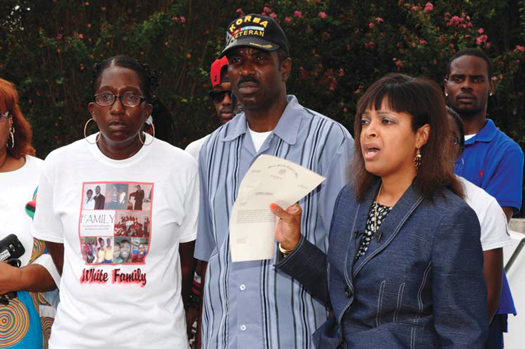 NEW ORLEANS – The family of a 22-year-old Black man, their attorneys and Rev. 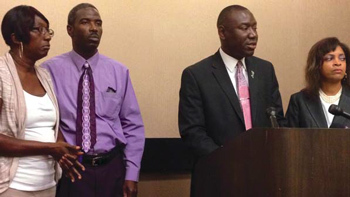 Al Sharpton held a press conference Sept. 4, expressing outrage and refuting claims by police that Victor White III committed suicide while handcuffed in back of a police vehicle. “Right now we are very upset at this point, and it’s a struggle because we still don’t have an answer. We don’t know the truth and the truth is being hidden right now,” the young man’s father, Rev. Victor White, Sr. told The Final Call in a telephone interview before the rally at the historically Black college.At the press conference and rally held at Southern University A & M College in Baton Rouge, they also called on the federal government to open an independent investigation into the shooting which occurred on March 3. “America has always been in denial when it comes to police brutality. Fortunately, these atrocities are now coming to the surface,” said Dr. Watkins. This entry was posted on Thursday, September 18th, 2014 at 5:27 pm	and is filed under Other Articles. You can follow any responses to this entry through the RSS 2.0 feed. Responses are currently closed, but you can trackback from your own site.